East Coast Commodities Warehousing, Stuffing and Transloading Montréal wishes to notify its clients of the New and Revised Spring Thaw Target dates for 2019. Please note that the target dates represent the most likely start and end dates of the thaw period for each of the three zones. Depending on the changes in weather conditions, these dates may be moved ahead or postponed. 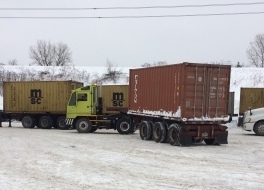 The ministry reminds users of heavy vehicles and shippers that the authorized load limits are reduced during the thaw period on all public roads. This is done every year to account for the road network’s lower bearing capacity during this period. For the thaw period of 2019, the target start and end dates of the load restriction period for each of the thaw zones are indicated below. East Coast Commodities Stuffing, Transloading and Warehousing in Montreal wanted to thank all its customers for their time during the CropSphere Conference in Saskatoon last January. It was great to exchange the latest news, discuss ongoing projects and future opportunities, map out few interesting projects and tackle some things that have been overlooked in a day to day routine. As per projections, we expect the increase of volume starting 2019. And we have noticed a spike of activity in January that came along with the winter in Montreal. And, indeed, “Winter in Montreal” – this is basically what marks the month of January and will do so for February. Mother nature made everyone to follow its schedule and adjust all the plans. At East Coast Commodities Stuffing, Transloading and Warehousing in Montreal, we united our efforts to be able to still deliver to our customers in spite of the harsh weather conditions. The yard hours were extended, including to weekends and our crew is always on top to keep the yard ready for both drivers and workers to perform their job. Being in the middle of a complex logistics chain, East Coast Commodities Stuffing, Transloading and Warehousing Montreal has to remain flexible to regroup and perform in the ever changing environment. The end of January was especially tough, when rail operations were affected by the weather conditions – snow storms, low temperatures, icy road conditions – all that created an immense backlog. Multiple units couldn’t not be grounded off trains for days, so everyone operated under complete uncertainty. But we are certain that slowly but surely, the situation will straighten up and we would like to thank all our customers and all the parties involved for their cooperation which is crucial to get the job done. At East Coast Commodities Stuffing, Transloading and Warehousing Montréal, we are ready to meet 2019. We have been working on optimizing our operations by implementing lean principles and increasing our productivity - all that with our customers in mind. We are entering a second week of January and getting into a work routine after the holiday season. With New Year and new hopes, the farmers, traders and other service providers of the pulse industry in Canada are getting together at CropSphere in Saskatoon on January 15th and 16th to discuss the news on tariffs and trade, the farmer’s right to repair their own equipment, and share the latest market analysis on commodities and projections for 2019. The Port Terminals are catching up with the workload after the port closures during holidays and their operations are coming back to normal. Lately, we have been experiencing frequent changes in vessel’s ERD’s and LRD’s and our goal was to work closely with the terminals, lines and our customers to insure the smooth and timely communication flow to meet the deadlines. We would like to Thank so much our staff, our clients and suppliers for a great effort and work well done all year and your amazing support. Without you, we wouldn’t be one of the leading companies in the industry. Looking forward to a wonderful 2019. This November, it is not only a sign of winter, as unusual temperatures and snow storms have hit Montréal, but when you are in stuffing and transloading agricultural products and warehousing business, it is a sign of a busy time of the year. We, at East Coast Commodities, stuffing, transloading and warehousing Montreal, mend our sails when the weather is fine, so our warehousing, stuffing and transloading facility in Montreal is ready to face the winter and to service our customers during the peak season. We have noticed the increase of inquiries for transloading services via Montreal and started to work with few more clients that allows us to optimistically look into the future. Let us show you how we perform. Reach us out to get our pricing for bag to bag and totes transloading at our facility in Montreal, and to inquire about other services we provide – warehousing, trucking, project cargoes. 2018 SIAL Conference in Paris, held in October, gave all of us a good projection on what is going to happen in the food industry in general, and pulse trade in particular. Our stuffing, transloading and warehousing facility in Montreal has seen steady volume during this month as well. We offer practical solutions for your freight at our hub in Montreal. Send us your inquiries, you will not be disappointed. East Coast Commodities Warehousing , Stuffing and Transloading Montreal would like to advise all clients that effective September 17th, Termont terminal has announced a $35/container fee for extended gate hours. As of September 17th all port terminals are subject to this fee for laden containers in import or export. Effective September 17th, 2018, MGT is applying a $35 Terminal Efficiency Fee applicable to all full import and full export containers. Our tariffs will be increased by this fee if our pricing does include pick ups or drop offs at the Port of Montreal. We will advise if Termont is following suit if and when they announce such fee. Temperatures have remained high during the month of August, however our operations have remained pretty steady during this month. Volumes have continued to increase during this month at East Coast Commodities warehousing, transloading and stuffing facility in Montreal. We expect a further surge of volumes during September so hurry and reserve space for your goods with us. Project cargo volume for awkward pieces have also increased this month. Contact us for pricing on any akward pieces you may have for import or export. Our group of specialists will be happy to help. Summer is here and temperatures have been soaring up to 45C in July. Operations at East Coast Commodities stuffing, transloading and warehousing Montreal were adversely affected during the peak temperature periods, however all operations got completed by the dead lines. As warehousing space is getting more and more scarce in Montreal, and costs are steadily increasing, call us now to secure your warehousing merchandise before its too late. Please take note that the East Coast Commodities warehouse, stuffing and transloading facility in Montreal will be closed on Monday, June 25, 2018 for St-Jean Baptiste Day, and July 2nd, 2018 for Canada Day. Spring Thaw 2018 is finally over since end of May and usual cargo weights are now legal throughout Quebec. East Coast Commodities warehousing, stuffing and transloading facility is ready for your volume surges during the summer months. Due to spring thaw restrictions in force from March 5th to May 4th, volumes of the regular heavy loads have decreased a great deal during March and April at our warehouse, stuffing and transloading facility in Montreal. 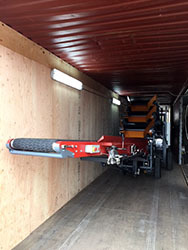 Exporters and importers of these heavy loads find it prohibitive to transport their goods throughout Montreal as special chassis equipment to carry those goods are at a premium. Lighter loads however have been steady throughout these period as usual. As Spring thaw is coming to an end beginning of May, we expect volumes to increase and have a full steady occupancy again in May. Please contact us soon for our pricing, terms and conditions to secure space availability for your goods. Zone 1 will include CP and CN Montreal rail Heads as well as the Port of Montreal. It is also important to note that the weight restrictions not only apply to the total cargo weight in the container and its tare but also to the distribution of the weight over the axles of the chassis. If the weight is not distributed evenly across all axles, the container will then be subject to an axle overloading fine. All charges will be for the account of the shipper. Start and end dates by zone are subject to change, without notice, depending on weather conditions. For further information concerning Spring Thaw regulations please contact us. East Coast Commodities warehousing, transloading and stuffing Montreal wishes everyone a Happy New Chinese Year of the Dog ! January and February 2018 have been most uncommon, showing both extremes in a very short period of time. Temperatures going from -40oC to almost 0oC. Snow falls ranging 30 CMs to rain and freezing rain. This has affected somewhat our operations at East Coast Commodities Montreal Stuffing and transloading. Working conditions have not been the best and we have seen slowdowns as a result of weather conditions. Our recovery capacity however has been remarkable and we have caught up in a very short period of time. This has allowed the majority of shipments make it on time to our customers as well as the port terminals in Montreal. 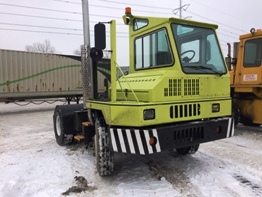 We have added another shunter truck to our terminal to boost operations during the tough times. March is around the corner and we expect weather to improve although heavy snow falls are still expected this month of February. Railways have been under performing with very heavy delays due to weather and lack of equipment in Montreal. This has further affected the incoming/outgoing flow at our facility. 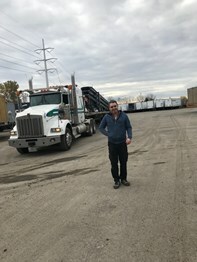 To the point where our Montreal trucking and transport division Contruck has helped us with pick up and deliveries from and to railhead terminals to improve the flow of cargo into our Stuffing and Transloading facility in Montreal. If you experience delays at the railhead terminals in Montreal, call us to find out how we can help you move your loads quicker to your final destination. The East Coast Commodities Stuffing, transloading and warehousing Montreal team wish all customers, suppliers and partners a Happy and successful 2018. Thank you for your continuous support. Your success is our success! Last month of the year is here and we, at East Coast Commodities warehouse, stuffing and transloading facility Montréal are ready to take on winter with our winter equipment. Temperatures have started to plumet in Montreal and snow precipitation is becoming now the usual frequent event. Frequent delays from the railways are being observed lately, however our flexibility is key to ensure cargoes flow from and to the Port of Montreal to complete the import and export cycle. Call us to find out how can we help you with your cargo. September has been a busy month for our warehousing, transloading and stuffing facility in Montreal. Volumes have started to climb steadily as usual this time of the year. If you need warehouse space in Montreal, now it’s the time to contact us as we expect volumes to continue increasing in the next few months. The 2017 CSCA convention in Vancouver was a success and new crop harvest is on the way. Despite the dry weather in the Prairies, reports indicate 2017/2018 pulses crop will be good. We, at East Coast Commodities, are looking forward to the new season. Our warehouse, stuffing and transloading facility in Montreal is now in top shape to start receiving the new crop volumes. If you have not already, contact us for the new season pricing for bag to bag and totes transloading at our facility in Montreal. Our general merchandise warehouse is already at 80% capacity so if you want to secure your business till year end, now is the time. As steel prices are increasing, most our old empty container stock has been sold during the summer. 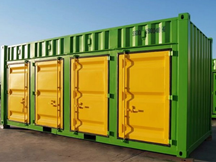 We still have some 20’ std and HC containers left at competitive prices before the new batch of containers comes in so if you want to save few dollars, hurry up since new batch of used containers will be at a premium. Finally summer is here and hot temperatures are the norm in the month of July in Montreal. Our transloading, stuffing and warehousing facility in Montreal is ready for these hot summer days to handle your volumes from and to Montreal. If you are attending the CSCA in Vancouver and wish to meet with our team, let us know, we will be happy to meet with you and discuss your needs for next 2017/2018 upcoming season. Do you need to buy containers for storage or for any other purpose ? Do you need heavy machinery ? Do you need to store your equipment ? Call us for prices, terms and conditions. Meantime we wish everyone in Canada, Happy 150th !!! Please take note that the East Coast Commodities warehouse, stuffing and transloading facility in Montreal will be closed Monday, June 26, 2017 for St-Jean Baptiste Day. East Coast Commodities transloading, stuffing and warehousing Montreal will be attending “Pulses 2017 – The Future of Food” that will be held in Vancouver From July 10th to July 13th, 2017. The GPC and the CSCA are putting together the biggest event ever and we will be there. If you wish to meet to discuss next pulse season with us, let us know and will be pleased to see you there. Spring Thaw 2017 is finally over since May 5th midnight and usual cargo weights can be hauled now from and to the port of Montreal without Quad chassis. Volumes are starting to pick up again as a result of lifting weight restrictions. East Coast Commodities warehousing, stuffing and transloading operations are ready for the new in/outbound flow of cargo coming in this month. Send us your inquiries. Whether it is for general merchandise, specialty grains, special projects (out of gauge/over dimensional loads), long term storage projects, container sales or modifications. We are here to assist ! Please note that new Spring Thaw Ending Date as per latest update from DOT Quebec is May 5th, 2017. Please contact us if you have any questions or if your shipments are affected by the new extended 2017 Spring Thaw Period. The worst of winter is over and spring temperatures are almost here. Due to Spring Thaw road restrictions, shipping heavy loads gets more expensive for clients as they have to either pay same freight for lighter loads or pay higher freight for heavy loads. As a result, the overall volume of these heavy loads has slowed over Montreal and it will continue to be at very low levels till the restrictions are lifted on April 28th, 2017. At our stuffing, transloading and warehousing facility in Montreal, we are having now more space available, hence please call us with your volume offers and take advantage of this slow down which won’t last long as we expect volumes picking up again end of April. 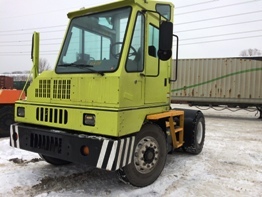 Our container and heavy machinery sale division is starting to get busy as inquiries are starting to poor in for containers and container modifications as well as specialized heavy machinery. If you have any of those inquiries, please contact us. Remember that we handle special projects too: from wind turbines to satellite dishes, Oil rig platforms and any oversized cargoes. We can help you with those ! The sudden Spring Thaw announcement by DOT on Feb 23 that the Thaw starts on Feb 27th caused chaos in Montreal. Hundreds of intermodals moving from USA, other provinces of Canada as well as hundreds of import containers coming in through Vancouver, Halifax and Montreal were overweight already “in transit”. With such little notice, none got prepared to take effective measures and ship lighter. Even CP and CN accepted overweight contrs at origin not knowing that such a “sudden” measure would be introduced. East Coast Commodities warehouse, stuffing and transloading facility in Montreal as well as our Montreal transport division Contruck Transport had to work around the clock to haul and unload as many loads as possible before Feb 27th. By doing this over the weekend, we saved thousands of dollars in “Quad” fees to our clients. Beyond Feb 27th, all overweight containers had to be hauled with Quad chassis to be legal over the Quebec roads. Another important highlight during this month was the 30 CM Snow Fall we had between March 14th and March 15th which left Montreal completely paralyzed as roads were either blocked or cut off which made it impossible for our drivers to transit. Things are starting to slowly go back to normal and we expect to be all caught up by Friday March 24th. Due to an unexpectedly mild spring, DOT Quebec has announced on February 23rd, 2017 that Spring Thaw in Quebec starts on February 27th, 2017. This is putting a lot of pressure on both exporters and importers to get their loads to and from the port in a very short period of time. At our warehouse, transloading and stuffing facility in Montreal we are working very hard to make sure goods are received and shipped in a timely fashion and relief clients from the worry of having their imports and exports getting stuck at the different terminals. Getting your cargo unloaded or loaded before Spring Thaw, will mean more savings for ECC clients, by not having to use Quad Chassis which are nowadays at a very high premium. These type of chassis are unavoidable once Spring Thaw comes into effect for heavy loads. Spring Thaw is expected to last till April 28th, 2017. Pls contact us for more information on the Quebec Spring Thaw Period and ways East Coast Commodities can take care of your loads. January, has been, just like December, a very challenging month with great oscillation of temperatures from -20C to +1C, however we managed to get all vans and containers unloaded/loaded and delivered in time to the different points we ship from/to our warehouse, transloading and stuffing facility in Montreal. Now we are looking forward to what is expected to be a very cold February. East Coast Commodities Management and Staff take the opportunity to wish all our customers and suppliers a Fantastic 2017 ahead. Thanks you for your support and looking forward to strong New Year together. Temperatures have plummeted in Montreal during few days this month to reach -25/35C with the wind factor. In addition, we have had a few heavy snow falls (up to 14 cm) and a lot of freezing rain precipitation. Weather has showed large variations of warmer (0 to -1C) and very cold (-25C) from a day to the next. This has created harsh conditions to operate in the yard and it has slowed down operations. Working in these conditions at our stuffing and transloading facility in Montreal has been challenging but we have managed to unload all vans, and all containers have gone out to port in time for closing. We will keep our customers duly posted about operational progress through our daily reports as volumes continue flowing steadily during this month of December 2016. As another year is coming to an end, we would like to THANK all our loyal customers for their amazing support in 2016. We look forward to continue being of service to you during 2017. In addition, the East Coast Commodities Team, takes this opportunity to wish all of you, your teams and respective families a very Merry Christmas filled with Love, Health and Abundance. The month of November has been very busy for our transloading, stuffing and warehousing facility in Montreal. With the addition of one more container handler, as notified earlier in October, efficiency has been the key word during this month. We have had the first snow fall during this month, however an accumulation of only 7 cms had no impact in our operations, as our crews cleaned up the yard quickly. Temperature averages in Montreal, generally above zero, have contributed to smooth pick up and deliveries for all our bookings. A new addition to East Coast Commodities stuffing and Transloading facility in Montreal. 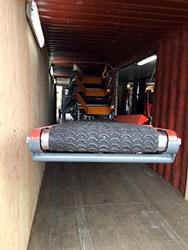 Another container handler with capacity to lift 90.000 LBS. Adding this handler to our facility will give us the flexibility to handle larger bookings without putting any constraints on our 75x20' triaxel chassis fleet. As the export and import season continues strongly during the fall, East Coast Commodities continues growing to offer our customers the flexibility and service you are looking for. You asked and we listened ! Harvest continues in Western Canada during the month of September. First New Crop loads are already moving to Montreal. We expect this month to be a busy month for our stuffing and transloading facility in Montreal. Warehouse bookings have increased substantially too, as many import commodities are pouring in through the port of Montreal. Export cargoes of tote bags with primary products like grains, seeds and potash are also picking up helping to balance the import/export volumes. You can count on us for all your warehousing and transloading needs. Call us to book space in our facility before year’s end. Harvest in Western Canada started towards Mid-End August 2016 and we already see a lot of movement in the "trading scene". Weather permitting this could be a BIG year for the pulses industry in Canada. We at East Coast Commodities are ready for the new season. Our stuffing and transloading facility as well as our warehouse in Montreal have been getting ready during the summer months to ensure everything goes smoothly this fall. Contact us with your warehousing, cross-dock and transloading needs now that we still have space available. CSCA convention was a success and main industry players seem to be very optimistic about the upcoming new crop 2016/2017. Now we have to wait and see how the weather will affect the crops from now till harvest time. We, at East Coast Commodities, are ready for the new forecasted season volumes: transloading and stuffing, pulses, seeds and Agricultural products in our Montreal facility. Canadian Special Crops Association (CSCA) is holding its annual meeting in Toronto July 6-8, 2016. Pablo Metz will be attending to this convention and available in Toronto from July 5th to July 8th. If you wish to meet, please contact at your convenience. Do you need an inexpensive fully equipped office in your yard or construction site? Do you need a shipping container for storage ? Do you need to build a camp site to house a small or large group of people ? Do you have a site and always dreamt to have a house overlooking the lake or the mountains ? How about a coffee shop you can take with you to a better location in future ? Our technical team can put together for you any design that comes to mind. East Coast Commodities offers you a wide range of affordable possibilities using shipping containers to make your dreams and goals come true. 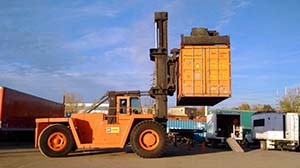 Check our Services section under Container sales and rentals and contact us now for pricing throughout Canada. As you most know, East Coast Commodities has been offering Shipping Containers for sale at its Montreal location for six years now. From Montreal we have delivered shipping containers and modified containers of all types across Canada. 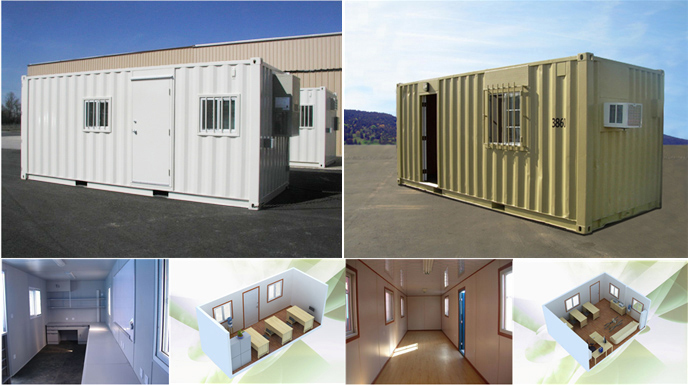 ECC is now able to offer Canada wide quality container houses, specialized containers, prefabricated houses as well as new and used shipping containers. We can now offer you complete packages to fit your needs. 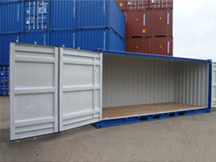 We are your “one-stop service” for shipping containers of all sorts. Our wide range of products and competitive prices will keep you coming back for more ! Spring is here and most of the ice/snow has melted away. Spring Thaw Weight restrictions are in force since March 14th in Montreal area and expected to last till May 13th, 2016 according to DOT Quebec. We, at East Coast Commodities Montreal, offer tailor made solutions for those customers who wish to load more weight than allowed. We have put at our client’s disposal our fleet of special chassis that can carry more weight due to an increased number of axles or spreads. As a result, our warehouse, cross dock and stuffing facility in Montreal has been able to keep steady volumes during this month of March. We ask clients with special requirements during this period to contact us for rates and availability of those chassis. Our entire ECC team would like to wish you a very Happy Easter. February has been so far the coldest month this winter, with temperatures reaching -28C (-40C with the wind chill factor). These temperatures have not affected our transloading, Cross-dock and warehousing facility in Montreal although we faced few slowdowns due to icy conditions. We still managed however to pick up and deliver all loads from and to the port of Montreal in time as per clients’ requirements. We will update this information during our March Newsletter. During the XMAS period, Montreal port terminals were only opened December 21st, 22nd and 23rd. They opened again on the 29th and 30th and closed on the 31st of December until January 4th. These closures made it very difficult to deliver all containers for export and to pick up full and empty containers for unstuffing/stuffing since terminals were heavily congested. In addition, a snow storm on December 29th, left 40 CM of snow all over Montreal. Operations at our stuffing facility, cross dock and warehouse in Montreal were affected by this storm. Thanks to our heavy investment last summer on new equipment and conditioning existing equipment in our yard, operations continued although slower than usual while our crews were constantly cleaning up the yard to allow operations to resume at the usual pace. By the 30th, our yard was back to normal and ready to face the New Year. A lot of deliveries and pickups have been planned for the week of January 4th when we expect temperatures to plummet in Montreal reaching – 30 C. This will again slow down yard operations and traffic to and from the port. We will keep our clients updated with anything that could adversely affect operations in Montreal. The East Coast Commodities team takes this opportunity to wish you all a Happy and Successful 2016. 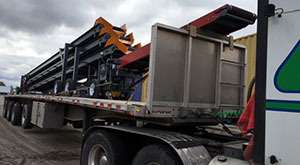 The year 2015 is nearly coming to an end and our transloading, stuffing and warehouse facility in Montreal is fulfilling all year end rush requirements of our customers. We kindly ask our loyal customers to book early your year end orders to avoid disappointments. This time of the year, our warehouse, transloading and stuffing facility, is very busy to comply with contracts and L/C requirements and deadlines as all those rush orders come through. The ECC team takes the opportunity to wish all our customers and their families a very Merry Christmas ! May this Holiday Season bring you all Love, Radiant Health and Abundance. 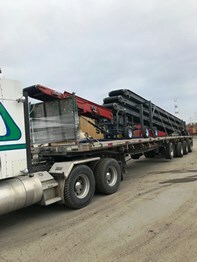 Last month East Coast Commodities received its third conveyor belt for stuffing, cross-docking and transloading bagged products at its facility in Montreal. 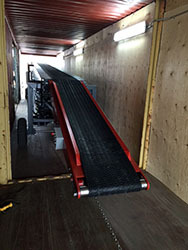 This third conveyor is more powerful and much more technologically advanced than the existing ones. It gives ECC additional stuffing capacity to cater for new business at its Montreal stuffing facility. This year we are much better prepared and equipped to handle the new season with its peculiarities and volume surges. ECC has gone from a capacity of 4000 containers per year to a new level of 7000 containers per year. Commodities handled are mostly pulses but also flour, seeds, rice, sugar, coffee and other bagged products. October is the month to say thanks for everything we have. East Coast Commodities would like to thank all our customers, suppliers and our superb ECC team for everything you do to contribute to our steady success. Summer is almost over and the new agricultural shipping season over Montreal has started. ECC’s transloading facility is already feeling the surge in volumes and is ready to take on the new season. ECC’s Warehousing volumes in Montreal are also starting to pick up a great deal. Contact us now to reserve space for your warehousing, transloading or cross-docking needs during this fall and upcoming winter. Last month was East Coast Commodities anniversary. 5 years in business in the Montreal area, warehousing, transloading, cross-docking in Montreal and still going strong. A BIG THANK YOU to all our loyal customers. Without you this would not have been possible. We have taken advantage of a relatively slow summer in Montreal to fix all our Yard equipment, containers, machines, warehouse space and the yard in Montreal. We are ready for your Montreal bound traffic and volumes, no matter how big or small. East Coast Commodities announces that a new conveyor belt has been ordered for delivery end of August for its stuffing and Transloading facility in Montreal. This new order will strengthen ECC's position and commitment to the Agri Transloading market in North America. During the Quebec Holiday on the 24th of June and the Canadian National Holiday on the 1st of July, East Coast Commodities will not be able to deliver any containers from our stuffing, transloading or warehousing facility since the terminals at The Port of Montreal are closed. We will however ensure all containers are delivered right before or right after these Holidays. Pablo Metz, owner of East Coast Commodities will be attending the Canadian Specialty Crop Association convention in Calgary, Alberta. The convention runs from June 20st to June 24th. East Coast Commodities started its transloading and stuffing operations in Montreal back in 2010 serving a wide range of shippers throughout Canada and USA. If you wish to meet up with Pablo during the convention, please send your message here. Quebec Spring Thaw ends May 29th for Montreal Zone 1. 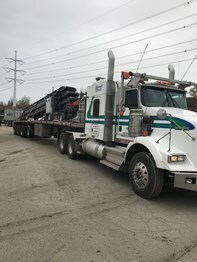 ECC will start accepting heavier loads for transport in Montreal effective May 30th with our fleet of tri-axel chassis for Zone 1. Weather across Canada is getting warmer and terminal operations have improved considerably. As a result deliveries and logistical operations are back to normal. 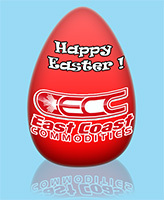 The ECC team takes this opportunity to wish everyone who celebrates, a Happy Easter !!! The Ministère des Transports du Québec reminds heavy vehicle users and shippers that, as each year, authorized load limits are reduced during the spring thaw period in order to take into account the weaker load bearing capacity of the road network during that period. The starting and ending dates of the load restriction period may be adjusted depending on weather conditions. Please visit the MOT website for further information. The weight restriction period for Montreal Zone 1 area will run from March 30th to May 29th. Zones 2 and 3 from April 6th to June 5th. These are approximate dates and as noted above could change. 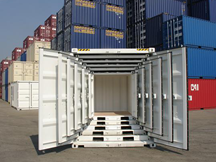 Weights must be reduced and cargo evenly distributed within the container to avoid possible charges and fines. Below weight limitations are provided as a general guideline. Transport Québec may adjust these dates depending on weather conditions. Note: These weights are provided as general guidelines only. Higher weights are possible, but subject to additional charges and equipment availability. Please note rail terminals in Quebec will refuse to accept and/or handle any containers that exceed the Spring Thaw Weight limitations. The Quebec Ministry of Transportation has announced the 2015 spring thaw period and zones. The forecasted start and end dates of the load restrictions are specified below. Please note that these dates can be changed by the Quebec Ministry of Transportation depending on actual weather conditions and it is advisable to visit the Ministry's website (only in French) for full and updated details. Cargo that is deemed overweight may require the trucker to use extra axles which will incur additional costs. Holiday schedule coupled with heavy snow storms and low temperatures have caused chaos in Montreal. Operations at our yard as well as port terminals have suffered as a result and have been slower than usual. 2015 is here ! we would like to thank all our customers and our dedicated team for their amazing support in 2014. We look forward to improve our customer service, time deliveries and fuel efficiency in 2015 so we can get more support and more referrals. The best way you can appreciate our service is by referring us to other companies in your industry. In order to ensure that our yard is accessible during the harsh winter months, East Coast Commodities has purchased another loader for snow removal. We take this opportunity to thank all our customers for their support in 2014 and our team for their great dedication to making ECC stronger Company every passing month. We would also like to wish all our customers and the ECC Team “Season’s Greetings”. 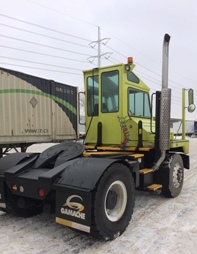 As the overall volume coming to East Coast Commodities warehouse, stuffing and transloading facilities in Montreal is steadily increasing, ECC has purchased another shunt-truck to cope with the high demand of shunting moves required. 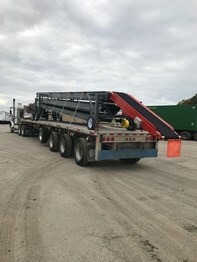 Due to the increasing demand of our loyal customers, East Coast Commodities has just added to its existing Equipment another grain conveyor belt at its Transloading facility in Montreal. This means that ECC’s capacity has now increased to 150 containers per week (poly, Jute, paper and Tote bags). Depending on this season’s volume, ECC may order another belt for delivery still in 2014, otherwise in spring 2015.